New VRE Station Gets Spotsylvania Residents to D.C. The Virginia Railway Express is giving commuters in Spotsylvania County, Virginia, a new way to get to downtown D.C. The station near the intersection of U.S. 17 and Crossroads Parkway opened Monday, with the first train leaving at 4:57 a.m. and arriving at Union Station at 6:29 a.m. The station is part of the VRE's existing Fredericksburg line. The VRE said all trains will continue to operate on the existing schedule, with the addition of a Spotsylvania stop eight minutes before the Fredericksburg station. The Virginia Rail Express is giving commuters in Spotsylvania County, Virginia, a new way to get to downtown D.C. 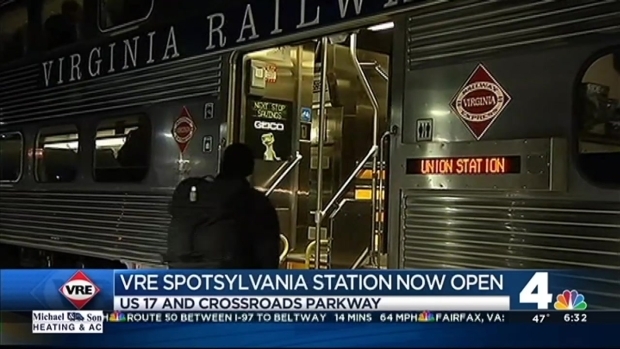 The station near the intersection of U.S. 17 and Crossroads Parkway opened Monday, with the first train to Union Station leaving at 4:57 a.m.
VRE and local officials said the addition is an important milestone in VRE's expansion plans, the Washington Post reported. County Supervisor Gary Skinner says he's hopeful it will bring federal agencies and good-paying jobs to the area, about 60 miles southwest of the nation's capital. The next closest station is in Fredericksburg, about six miles away. County and VRE officials say the new station will help reduce traffic on Interstate 95. They project that as many as 1,200 Spotsylvania residents will use the train within six months of operations.